This species is accepted, and its native range is Central African Republic to Kenya and NE. Namibia. Shrub 1.5–3.5 m tall or small tree 5–15(?–20) m tall*, freely regenerating. Bark pale brown or grey, smooth or somewhat striated or ridged in larger trees. Young branches golden brown velvety tomentose, soon glabrescent. Leaflets (1–)3–5(–6)-jugate, oblong, elliptic, ovate or obovate, (4.5–)6.5–18(–23) × 2.5–9.5(–13.5) cm, cuneate, rounded or subcordate at the base, entire or very slightly serrate, rounded or obtuse to very shortly acuminate at the apex, puberulous or pubescent above, densely woolly velvety beneath. Petiole 2–9.5 cm long; petiolules 0–2 mm long; pseudostipules subulate, 0.5–1.3 cm long, tomentose. Flowers in dense tomentose terminal panicles, at first tight clusters ± 8 cm long, later 10–30(–40) cm long. Pedicels 1–2.8 cm long, bracts 0.5–1(–1.5) cm long. Calyx 1.9–3.3(–4) cm long, 1.5–2.5 cm wide, obtusely cuspidate or uncinate, split to about 4–8 mm from the base, densely golden tomentose. Corolla bright yellow or orange-yellow with maroon guide lines in throat and maroon stripes or spots on 3 lower lobes; tube 3.5–4.5 cm long with lobes 1.5–3 cm long and wide and upper part of tube with conspicuous glands. Capsule nearly straight or curved, (20–)39–87 cm long, 1.4–2.8 cm wide, with prominent longitudinal median ridge on valves and marginal ones near sutures, densely golden velvety tomentose. Seeds narrowly oblong, 3–4 cm long, 0.7–1.2 cm wide including the wing. K. Schumann merely gives ‘aus den Steppen Ostafrikas’ for his M. lanata but it is almost certain that Fischer 461 (Kagehi), Buchwald 697 (Usambaras), Holst 2228 (E Usambaras, Magila) and Busse 50 (probably T 3) are all syntypes; duplicates of the last three at Kew are isosyntypes. 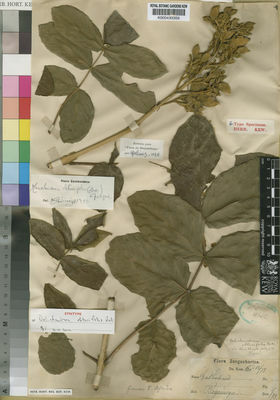 M. obtusifolia has been cultivated as an ornamental in Kenya (Nairobi, 1942, Bally 6168). Bushy shrub up to 1.5–5 m. or small tree 5–15 m. high. Bark light brown to grey, smooth to somewhat striated in large specimens. Branchlets velvety tomentose with golden brown hairs, soon glabrescent. Leaves 18–56 cm. long (1)3–5(6)-jugate, inferior pairs smaller, pseudostipules 0.5–1.3 cm. long, subulate-acuminate, tomentose; petiole 2–9.5 cm. long; leaflet-lamina (4.5)6.5–5.17(23) × 2.5–9.5(13.5) cm. ; elliptic to oblong, ovate or obovate, sessile, apex obtuse to rounded, sometimes acute to shortly acuminate, rarely longly acuminate, base obtuse, rounded to subcordate, sometimes asymmetric margins entire or rarely thinly serrate pubescent to puberulous on the superior surface, densely woolly on the inferior; lateral nerves (6)7–12(14). Inflorescence a dense and tomentose terminal, many-flowered densely branched panicle 10–30(40) cm. long; pedicels 1–2.3(2.8) cm. long; bracts 0.5–1(1.5) cm. long. Calyx 1.9–3.3 × 1.5–2.5 cm. obtusely cuspidate or uncinate, fissuring down to 4–8 mm. from the base, densely tomentose with golden hairs. Corolla bright yellow, funnel-shaped to campanulate; lobes spreading, subcircular, 1.7–3 cm. in diam., the 3 lower ones streaked brown-reddish and with conspicuous glands near the mouth of the 2.5–4.5 cm. long corolla tube. Stamen-filaments 1.5–2 cm. long, pilose at the bass, adnate to the corolla tube up to c. 1 cm. from the base; anther-thecae 2.3–3.5 mm. long, divergent. Disk 2 mm. long and 4–5 mm. in diam., cupuliform. Ovary 5–8 mm. long; style 17–27 mm. long. Capsule 20.84 x 1.8–2.5 cm., falciform to nearly straight, flattened, velvety tomentose with golden soft hairs, valves with a prominent longitudinally median ridge and two marginal ones near the dehiscing lines. Seeds 0.7–1.2 x 3.36 cm. including the wing. C.F.A. 122 Bignon. : 23 (1993).